To create the NEX-F3, Sony took its predecessor—the best-in-class NEX-C3—loaded it with revamped hardware aimed at everyday consumers, and gave the camera's shooting specs a boost. The finished product looks promising, and the price remains $600. Is it still the best camera in its category? The superb NEX-C3 was almost militant in its minimalism. Yes, it had a DSLR-sized APS-C sensor that required big lenses that jut out from the body. Still, the compact camera was pared down to a virtually buttonless package. The bottom line was the image quality—that made it the Battlemodo winner. The new NEX-F3 shares the same guts as predecessor. But some subtle changes, aimed at making life easier for beginners, make it a teeny bit larger. The question is whether Sony has improved on its baby boomer's effective (if imperfect) package. Sony's going the wrong direction with its hardware. That's really too bad, because it is trying to do the right thing—it's trying to make the NEX-F3 more appealing to people who might otherwise buy a point-and-shoot camera. In service of that goal, though, it has added hardware that doesn't make the camera easier to use in meaningful ways. Lets go down the list. The NEX-F3 now has a built-in flash instead of the tiny clip-on that came with the camera last time around. The camera's LCD now tilts a full 180 degrees (it moved just less than 90 degrees on the NEX-C3). Why do either? The built-in flash is an okay idea, but this is a crappy built-in flash, and it tends to lead to disappointing results. As for the screen—90 degrees makes more sense. Sony invested time and energy to flip the screen 90-more degrees so that it's easier to take self-portraits. Seriously? The downside of the older NEX-C3's compact, minimal design was that many adjustments were hidden behind menus. This made the camera tough for a novice to use. Unfortunately, Sony hasn't made changing settings any easier on the NEX-F3. To access the flexible features—one of the main reasons to spring for the NEX-F3—get ready to hunt through a deep menu. To be fair, the buttons on the back panel are programmable, so you can set them up to tweak frequently adjusted settings, like ISO and white balance. What this camera really needs is touchscreen controls. All of these tiny sophisticated cameras do. Instead, rather than improve the controls, Sony turned around and made its compact camera slightly larger. Sure, that means the camera's grip is a little easier to hold on to, and that the buttons are more spaced out, but Sony changed nothing about the camera's UI, and the number of buttons stayed the same. The NEX-F3 is snappy. It finds focus fast and fires almost instantaneously—this is definitely the most notable improvement in the camera's performance. From the menus to the shutter release, it's just more responsive. The camera was tested primarily in semi-automatic modes, and exposure and focus weren't always immediately correct in, say, the early-morning conditions that add a lot of contrast to a photo. Still, diving into the menus and adjusting the settings almost always produced the desired results. Like the NEX-C3, the camera's big, 16.2 megapixel, 23.4 x 15.6 mm sensor lets you shoot at high sensitivity without losing quality. The average viewer probably wouldn't notice a difference in image quality between a photo taken on the NEX-C3 versus the NEX-F3. The camera is supposed to be able to take photos up to a maximum ISO of 16,000, but you should stay below ISO 3200. See that image below? That's ISO 3200; you don't want more noise than that. Taking a cue from the competition, the NEX-F3 shoots at up to 1920 x 1080 HD video, an upgrade from the NEX-C3's 1280 x 720. The camera's settings also now list the shots' frame rates—clearly, Sony has its sights set on hooking some videographers. The video quality is better than before. But even with a slightly larger camera body, it's still hard to get a perfectly steady shot. The camera works well for impromptu recordings, but don't count on shooting a film with it. The NEX-F3 takes lovely photos, even in tricky situations. The camera is fast, responsive, and, with some tinkering, a more powerful shooter than its competitors. Interchangeable lenses and compatibility with a digital viewfinder will appeal to an aspiring photographer with plans to eventually step up to a DSLR. Like its predecessor, the NEX-F3 is hard to use. Its functionality is designed with people who are comfortable customizing controls and navigating menus—that might frustrate rookies just learning their way around cameras. The new 180-degree tilt screen is more gimmick than substance. A touchscreen to navigate the menus would be much more useful. 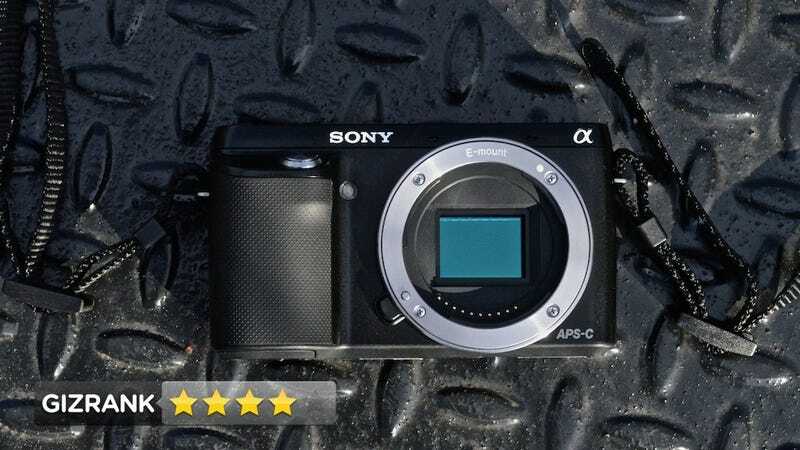 Yes, for $600, the Sony NEX-F3, like the NEX-C3, is a great buy. It's a major improvement for people who would otherwise buy top point-and-shoot cameras, like the Canon S100. It provides the image quality, flexibility, and some of the features of a DSLR. Although, if you want a camera you can stick in your pocket and master straight out of the box, this is the wrong one to buy. As for this generation's upgrades, the new hardware features aren't essential—to get a deal, consider looking around for a discounted NEX-C3.